The statement comes hours after Banerjee, upset with Congress leader Adhir Ranjan Chowdhury's attack on her over the Saradha chit fund case in the Lok Sabha, registered her displeasure with UPA chairperson Sonia Gandhi in Parliament. 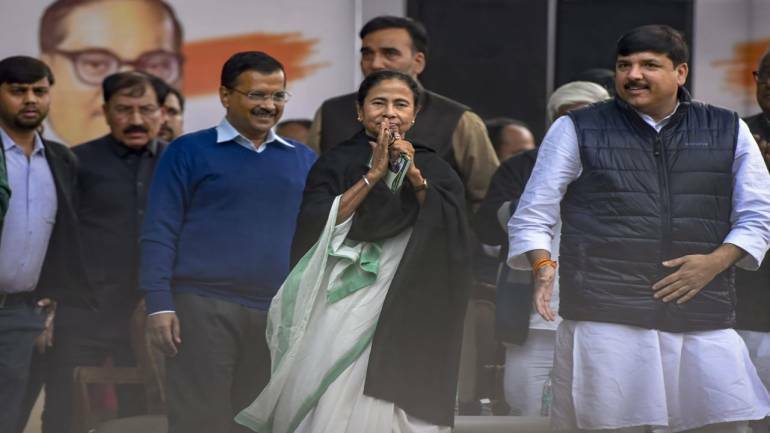 West Bengal Chief Minister Mamata Banerjee on Wednesday said that while the Congress and the Trinamool Congress will contest against each other in the state, they will fight together at the national level against the BJP. Sources said Gandhi, while trying to placate her, said, "We are accusing each other but we are friends," to which the TMC chief responded: "I will remember." "Any fight with the Congress will remain in the state. At the national level, we will fight together, this I am saying from the heart... For the greater interest of the country, I am ready to sacrifice my life, my party. I am ready to sacrifice everything," she said at the Aam Aadmi Party (AAP) protest at Jantar Mantar which was attended by several opposition leaders. Banerjee, who is in Delhi till Thursday, also met RJD's Misa Bharti, Bahujan Samaj Party's (BSP) Satish Mishra, SP's Jaya Bachchan and Dimple Yadav in her room in Parliament in the morning. Addressing the protest, Banerjee appealed to all opposition parties to play to their strengths and not cut into each others' votes. She also asked them to ensure that they get all the seats in the states they are strong in. "Whichever party is strong should work there, fight there against the BJP, in Delhi, it's AAP, in UP, it is BSP, SP, in Kashmir, there is Farooq Abdullah...for higher good, some sacrifices are needed...If we want, we can fight in many more seats, but we never do this for the higher good," she said. In an apparent dig at the Congress whose state unit is fighting tooth and nail against the TMC, Banerjee said while the Rahul Gandhi-led party is strong in the three heartland states, they should not cut into her party's votes in West Bengal. "We tell the Congress, if you are strong in Chhattisgarh, Madhya Pradesh and Rajasthan, you should fight there. But where we are strong, don't let the BJP win. I am used to fighting the BJP, CPM and the Congress because in Bengal, these three parties fight together. Even if we make an understanding, they don't transfer votes. I am used to this. I am not scared. How much ever they fight, I will get 42 out of 42," she asserted. The TMC chief also attacked the Centre over the CBI's failed bid to question Kolkata Police Commissioner Rajeev Kumar at his home, saying she has never seen a government that "stooped so low". "It is the prime minister's last day as elected leader in Parliament today," she said after the Lok Sabha adjourned sine die. "Everyone is afraid of Gabbar Singh. There are two of them -- (Prime Minister Narendra) Modi and (BJP chief Amit) Shah," she claimed. She said that the PM's speech in Parliament was "his last" in the House as a people's representative and that his government has reached its "expiry date". "They remember these people only during elections. They only want to make statues," she said. "Regional parties are not weak, my party, Sharad Yadav's party, Farooq Abdullah's party and the others are all recognised parties. It's just that the BJP has a lot of money. How much money is spent on one meeting of Modi? They give bike, cars, thousands of rupees...They have made a party office in Delhi which is no less than a shopping mall," Banerjee said. "I am not scared. Shrouds wait for me, I don't wait for shrouds (kafan humara intezar karta hai, hum kafan ke liye nahi). This is my fight," she said. Stating that the situation in India was more dangerous than the days during the emergency, Banerjee said democracy has become 'Namocracy'. "It is easy to see dreams but you should know how to dream. Modiji, you don't know how to dream, you know how to break the country. I know how to join the country...we will all fight together," she said.